Thank you all so my for reading my blog, leaving comments and supporting handmade through Brinner! It all means the world to me and I couldn't be happier! I want you all to know that every single comment you leave brings a smile to my face and every single purchase through the shop always leads to a 'squeee' or a little happy dance, usually both. I hope you all had a wonderful 2012 and I wish for all your dreams to come true for 2013! 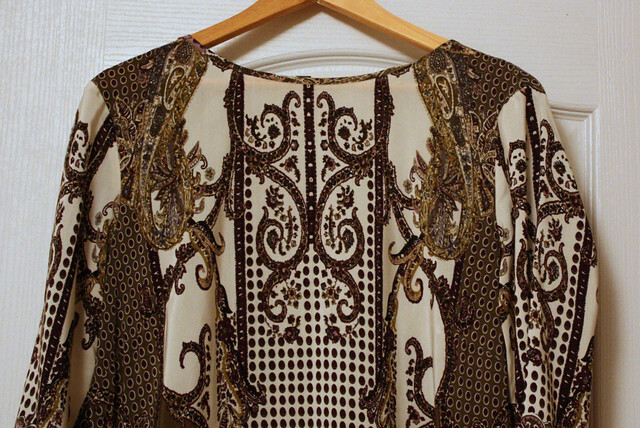 To mix it up for partytime, I am sharing with you a peek into my New Year's Eve party outfit. I'm practically a fashion blogger now, right? I made a year in review post yesterday about all the things I wrote about here on the blog. 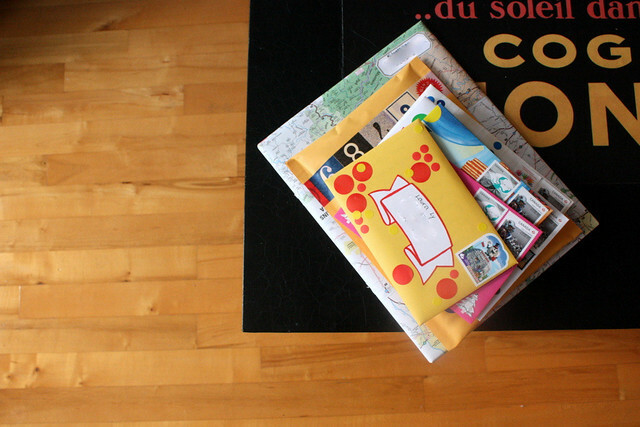 I did leave one particular topic out, as I figured snail mail deserves a year-end post of it's own. 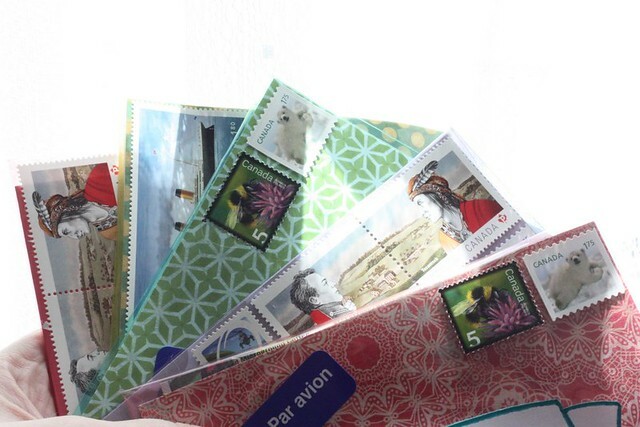 If you've been reading my blog for longer, you might remember me mentioning how I've always sent some mail, but those were mainly postcards from my travels and cards for special occasions like birthdays or holidays. 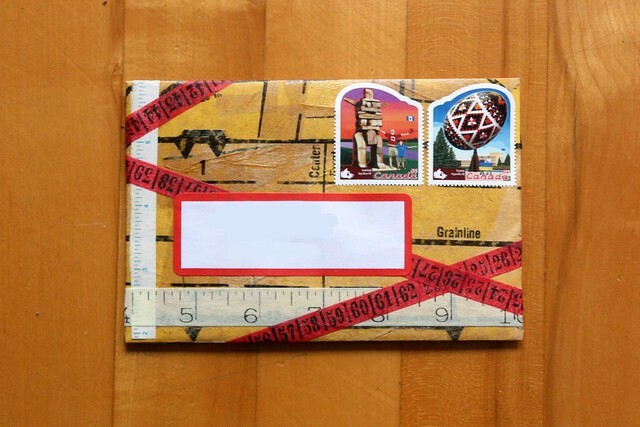 I did write some letters when I was a kid, but that dwindled off for many years. 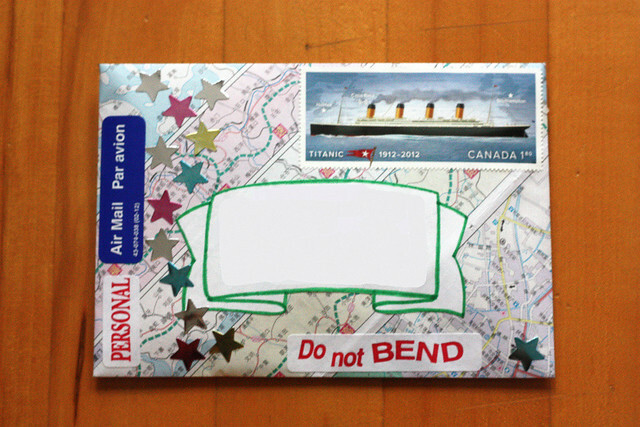 I slowly started paying more attention to pretty mail and soon couldn't ignore the desire to try it out myself. 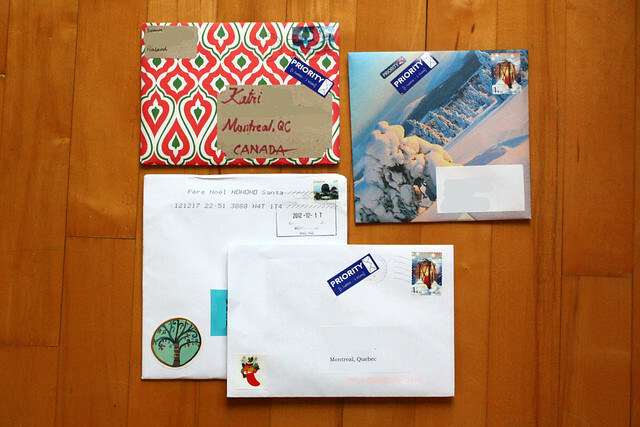 Admittedly 2012 was the first time in a long while that I actually had some extra time on my hands and was able to start dabbling in the world of snail mail. 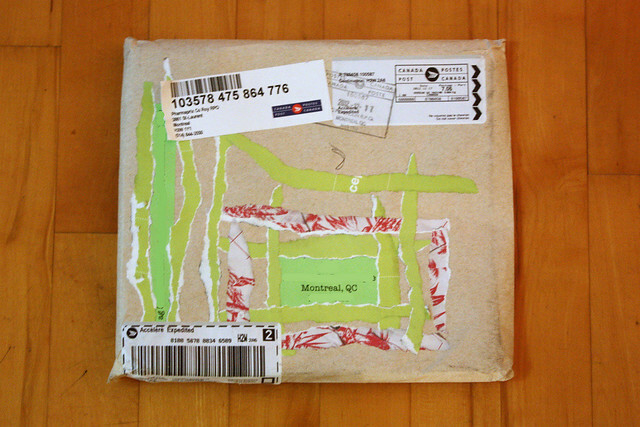 I felt like it would be a nice way to ring in the new year by looking back at some of my favorite mail of this year. 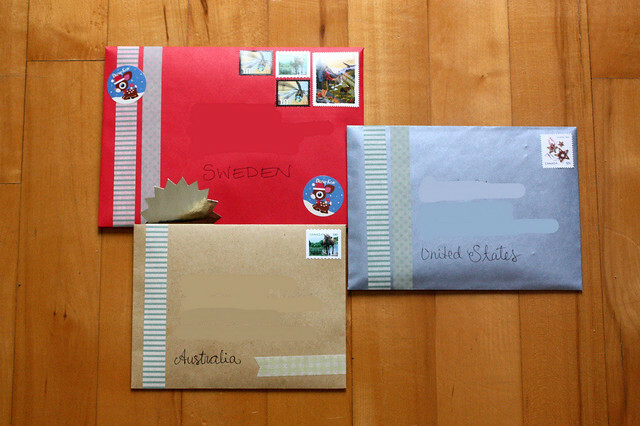 This piece of mail was featured in a Finnish magazine and I just loved how it turned out. There was a week when everything was covered in polka-dots, large and small. 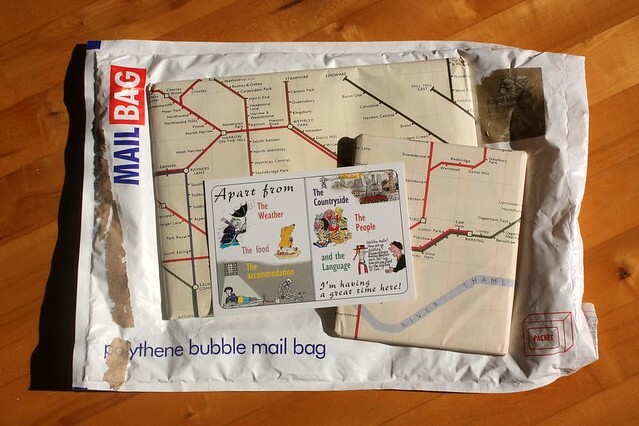 I've sent them near and far, to people I've never met and to those I've known for years. I know I've at least made a few people happy. 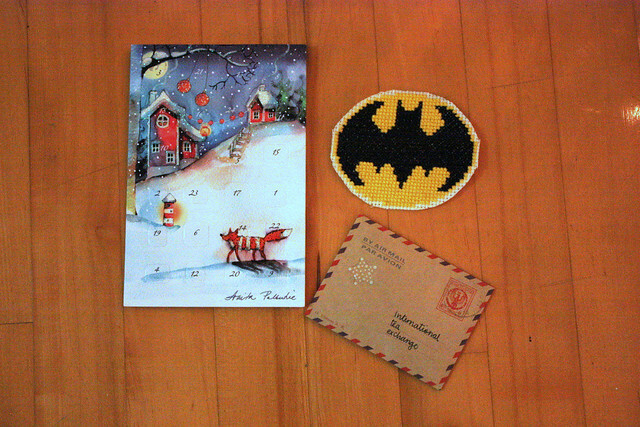 ...and awesome surprises, like Batman and tea and an advent calender. 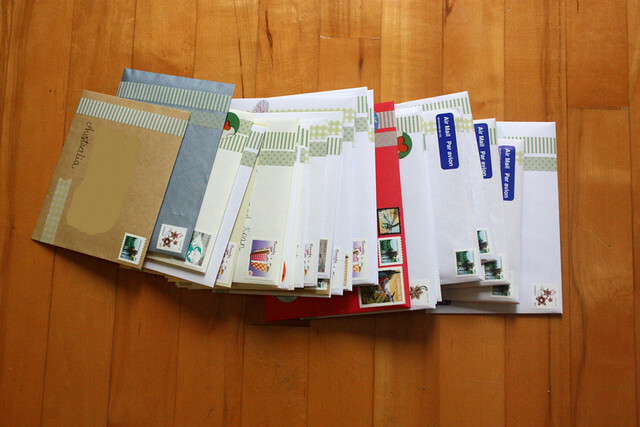 I've decided to make a few new years resolutions suggestions regarding mail. I will certainly keep this up. 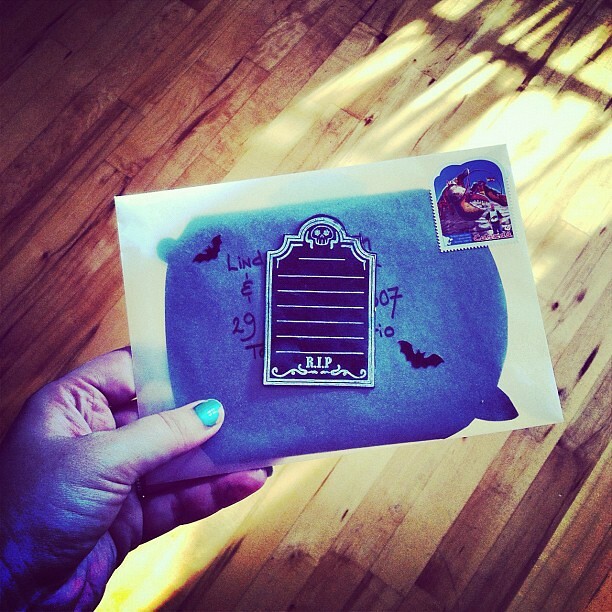 I will keep writing Mail Monday posts. 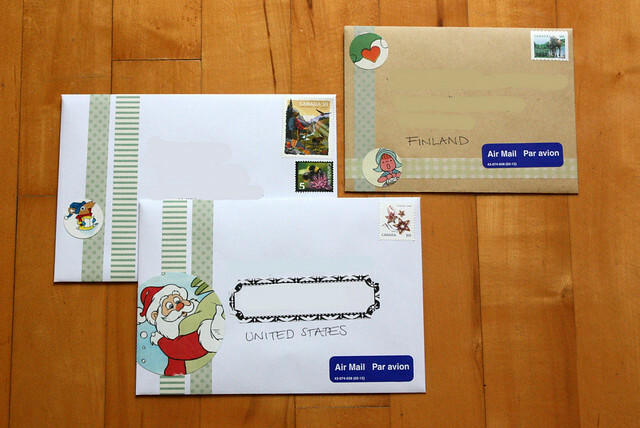 I will send even more mail in 2013. 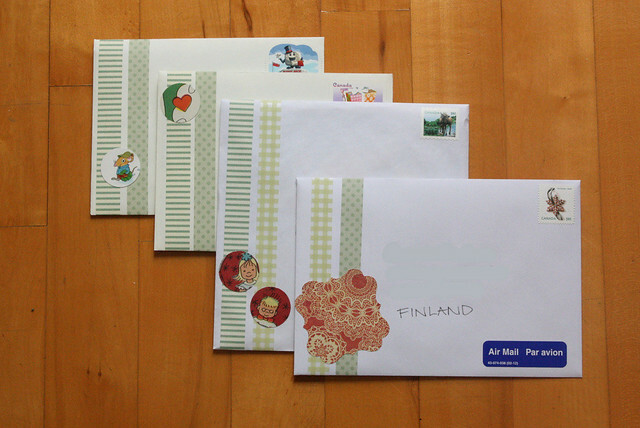 And I promise to send at least a few pieces of mail to people who are not expecting it. Did you have a good mail year? 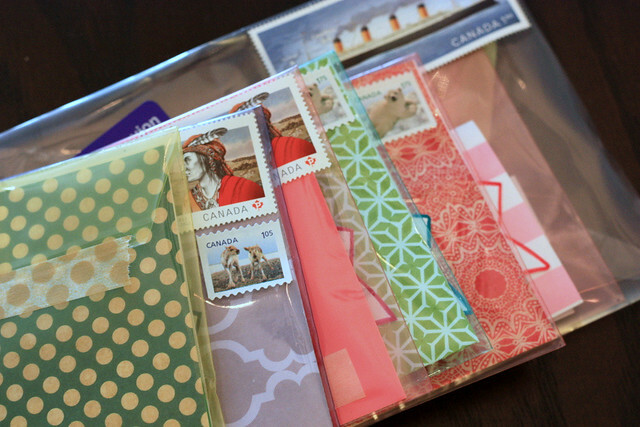 Do you plan on making mail-related resolutions? In July we had visitors staying with us and we were wandering around town all times of the day. 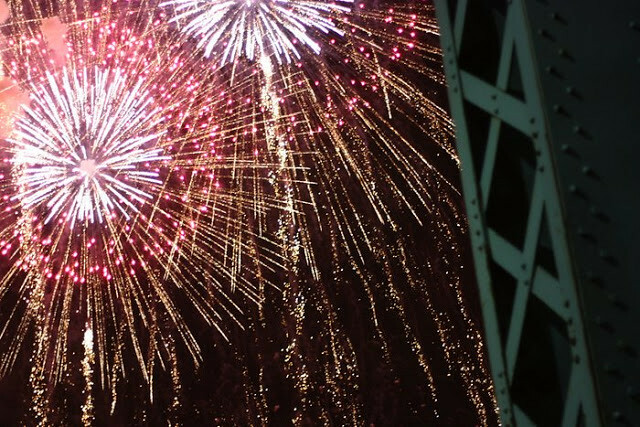 We went to see fireworks and spent a lot of time at Jean Talon Market. Brinner made an appearance at the McGill university and I made some great finds at the thrift stores again. July was a month of bridal showers, I attended one and helped organizing another. I made shower favors for the second one. I suffered an identity crisis and saw the Muppets live. In August I spent a lot more time with wedding related activities. 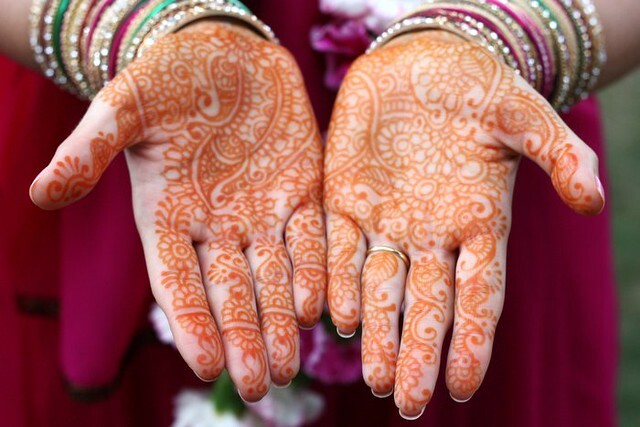 I was asked to photograph a Nikkah ceremony, I showed some details from the shower I helped organize, a few of us girls took the bride to be to a relaxing spa getaway in lieu of a bachelorette party and I went dress shopping, but came home with the most beautiful shoes in the world. 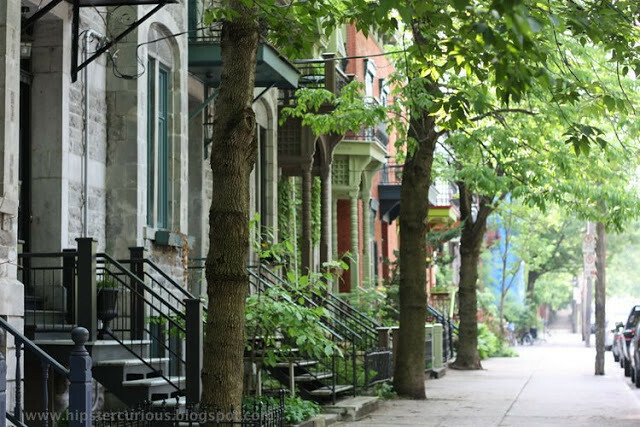 Chris and I spend a weekend in Quebec City, walking around and eating well. I fell in love with books (again! 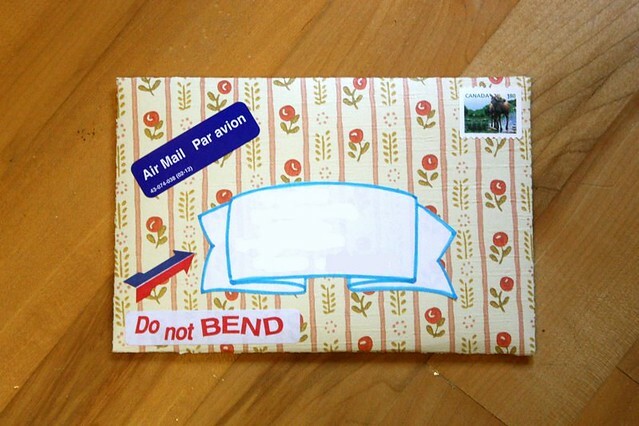 ), learned how to make granola bars and went bonkers ordering Korean stickers from eBay. September felt long and scattered. There were exciting things like being featured in 365 magazine and finally finding that one elusive item I've been looking for a long time. It was also the month were George got sick and I lost my creative groove. I tried different approaches to creating, starting from painting the bedroom and trying my hand at collages. I baked cookies, killed zombies, watched an amazing documentary and talked about books. A lot. When September was coming to a close I geeked out with friends and finally started getting creative again. October was a month of big days. It started right off the bat with my nephew Ryan being born on October 1st. Then the second of the weddings for this year got under way on Thanksgiving weekend, this is the one where both Chris and I were in the wedding party. And the party just continued on October 10th where Hipstercurious turned 1. I also discovered some ancient Egyptian artifacts and started employing complex vernacular to substantiate my intelligence. As all the celebrations were done, I started preparing for Halloween. 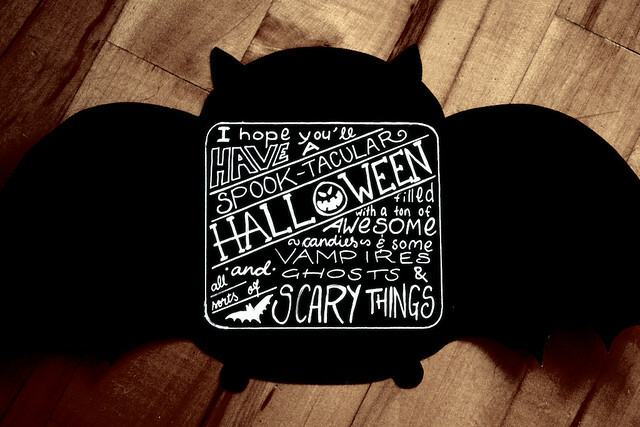 We carved a pumpkin that became Evil-Bob, I discussed costumes and made a bat card tutorial. I started November with a better plan for the blog, followed by an unsuccesful hunt for discounted Halloween candy. I was over the moon to be featured in the Discover Paper Holiday guide and that fueled my creative endeavors. I started making a ton of one of a kind ornaments for the December fairs. I found some beautiful vintage ornaments and made a DIY advent calendar tutorial that I know at least one person found inspiring. 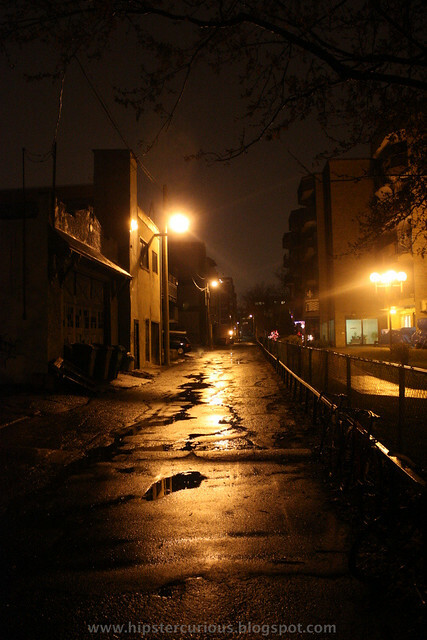 I enjoyed the dark nights, said goodbye to fall and welcomed winter. Chris and I set a new high score and celebrated the second anniversary of getting hitched in Vegas. December was awesome in more ways than one. Obviously because of Christmas, but also because of two crafts fairs, Old Skool Crafts and Puces Pop. Besides that, my work was featured in two major places; Urban Expressions and my first print magazine feature, Koto Living. We got a bit of snow first and then a whole lot more, which really allowed me to stay in and make some awesome DIY projects, such as a vintage ornament wreath, a winter scene complete with a plastic deer and of course some marshmallow chocolate pops, all with tutorials of course. 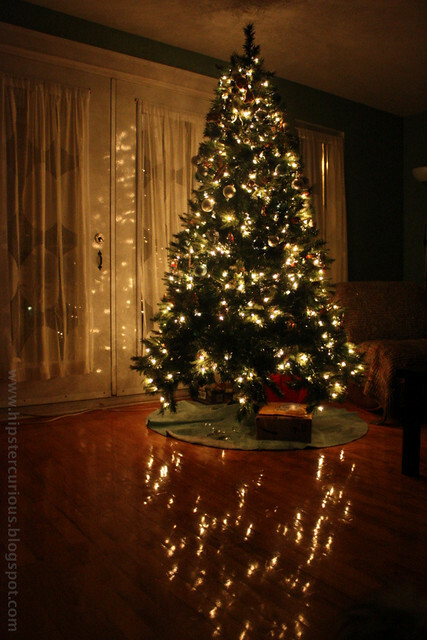 I shared some details about my tree and a peek at my home. 2012 was an awesome year. On a more personal note, it was unexpected in many ways, but definitely fulfilling in others. Thanks to my blog, I learned new skills and made some new friends in Laura, Jess and Mary. I had a successful year with Brinner and developed in leaps and bounds when it come to running my own business. I'm still not quite done with finishing off this year and I have tons and tons of ideas and plan for the next. Stay tuned! What were the highlights of your 2012? As 2012 draws to a close, it's the perfect time to look back and see all the wonderful things that happened this year. 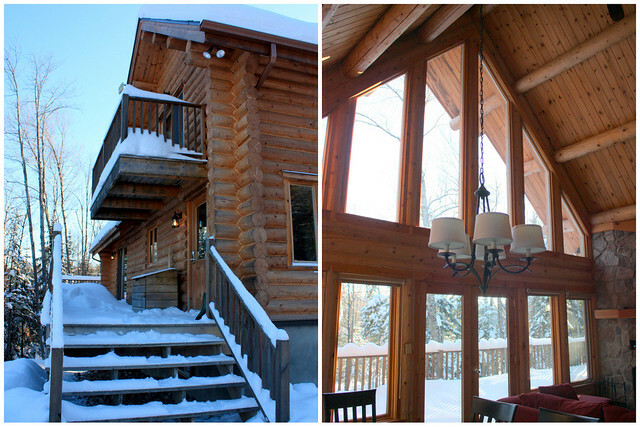 We rented a cabin and spent a long weekend doing all sorts of winter activities like snowshoeing, skiing and skating, not to forget soaking in the hot tub. After this weekend I decided that skating was the least offensive of the wintery activities and Chris and I started thinking about buying skates so we could do this again. It worked as I now have brand new skates! more on that later. In January I also thought about perfectionism, I introduced the small notebooks as the newest product for Brinner and made some awesome vintage finds. In February I was finding my creative groove that had gone missing for a bit. 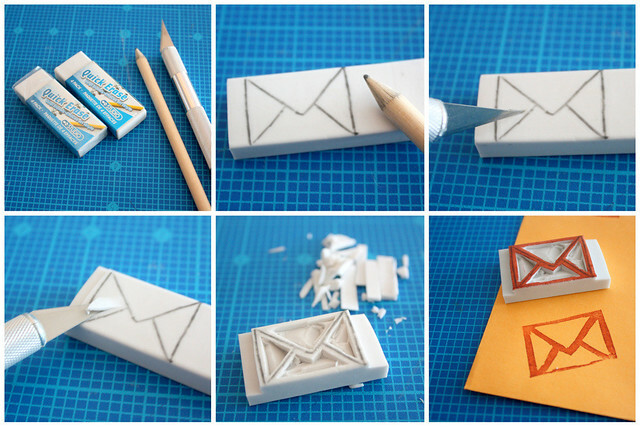 I made one of my favourite tutorials, the DIY stamps from erasers. It was so much fun and I've used the same method so many times since then. In my creative mode I also talked about what to do with old magazines and tried my hand in the kitchen too, where I ended making a true crowd pleaser, the Cilantro pesto. 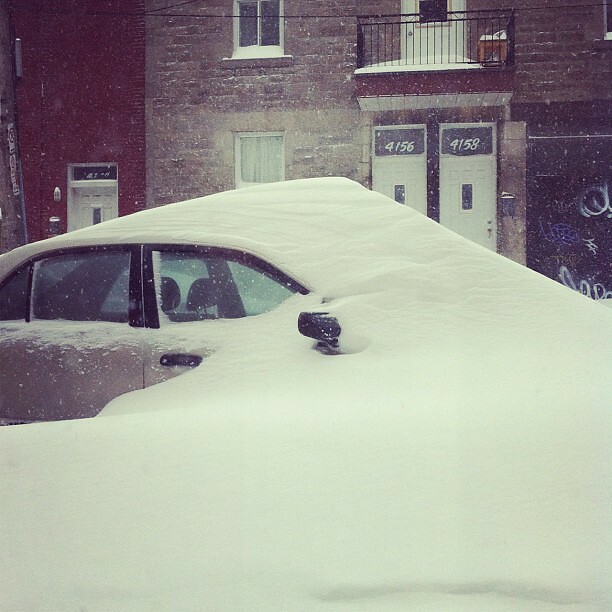 I also spent a weekend in the suburbs of Toronto for a long overdue girls weekend. The secret we found out about that weekend, was born this fall! I celebrated my 2 year Etsy Anniversary and thought my cats were being real brats. 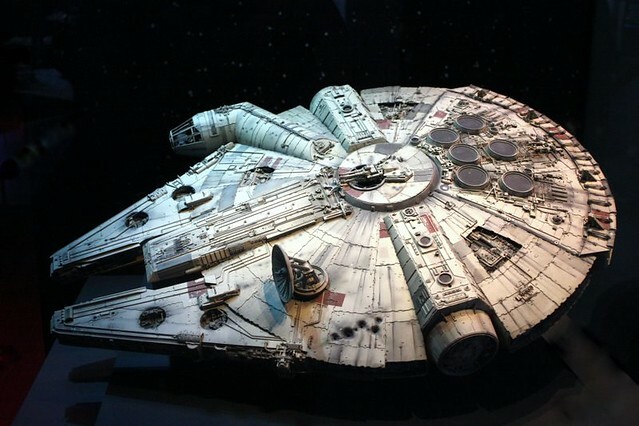 In March I thought a lot about my blog that I had been writing for 6 months or so. I realized it didn't look the right way and changed the look much closer to the current one. I turned 32 and continued my escapades in the kitchen. This was a successful month in that department as I came up with two successful recipes that are still in use, the tortilla soup and DIY "sun" dried tomatoes. I also made mini notice boards and wrote a tutorial, expressed my true feelings about healthy living and finally observed the encounter of the great hunter George and his nemesis. April was all about shoes. I bought a few (Marni) new pairs (glitter) and started my dream shoe closet project. I made some fantastic thrifty finds and talked about Batman. A lot (and even found a way to combine Batman and shoes). In April I also finally bought a new lens for my camera and started learning how to use it. Friday the 13th happened in April and I was not superstitious. May was a busy month for me. I started preparing for the first craft fair of the year, it took a lot of planning, crafting and I wasn't immune to craft-related injuries either. But, I was fueled well! Even though I was busy, I took the time to walk around my neighborhood and snap photos. In May I also took the time to bake brownies, answer 10 random questions and finish the shoe closet. I found one of my all time favorite thrift store finds, a vintage globe. I also spent a weekend in Ottawa, where I ate well and started the journey toward my friends wedding by making prototypes of her invites. June was very hot and humid. It was also the month of the Puces Pop craft show. I made a whole lot of products and tried to improve from the previous show. I even practiced my table setup at home. 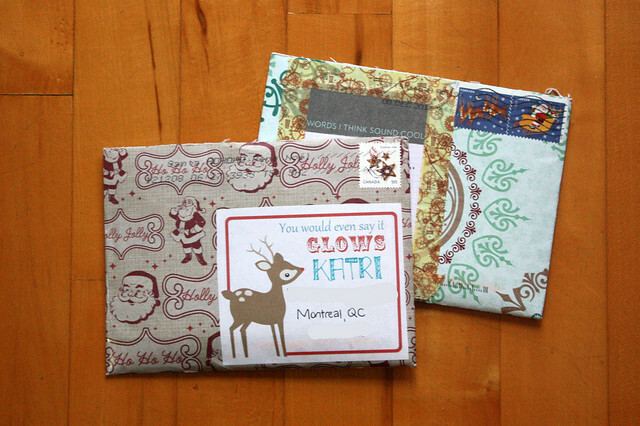 I really got into snail mail, even though I had been sending more mail earlier in the year as well. 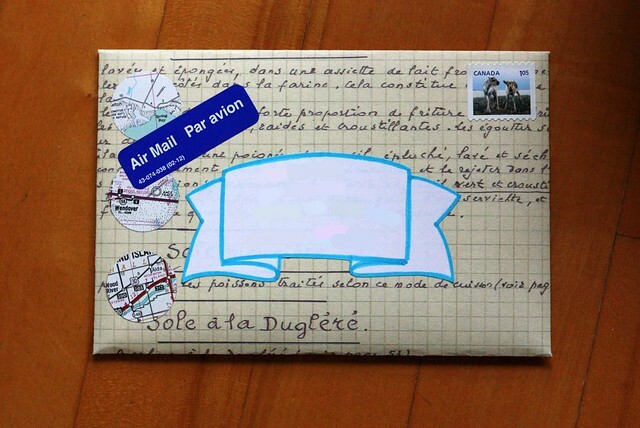 It was the transparent mail that really sparked the creativity with snail mail. I really put a lot of thought and effort into my mini balcony and ended up extending my living room to the gorgeous outside. I was thinking about cultural differences and schedules, started working on my friends wedding invites and found a treasure in the thrift store that still results into purchase requests from strangers. Part two of 2012 recap will follow soon! 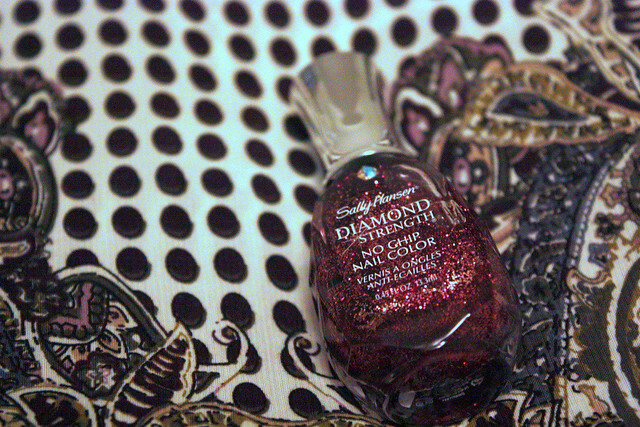 I realized that I've never really shown much of my home here in my blog. I felt like now would be a good time, with the decorations still up. Plus, I obviously cleaned for the holidays. There have been some glimpses so far, but nothing much. I'm not planning on making an full on tour either, but a few details with the holiday decor. The entryway got a ton of ornaments. 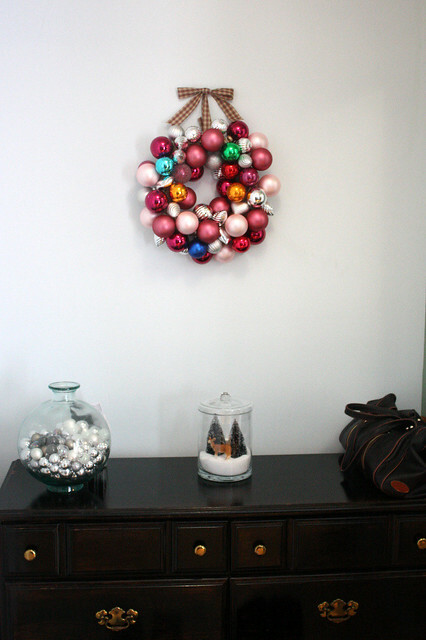 I ended up hanging the wreath I made on the wall, instead of the door just because of the delicate glass ornaments. the entry to our condo is on the left and there's a fairly large closet on the right. That's where my shoes live. I'm standing in the living room taking the photo. If I turn around on the exact spot where the previous photo is taken, you'll see my living room. This particular photo is taken later in the evening as the light comes in directly from the french doors during the day. Those doors behind the tree open to the tiny French balcony I've mentioned before. The one I have my herbs and tomatoes on in the summer. On the left of this photo is the dining area and kitchen. The upstairs of the condo is open, except for a powder room and the office. I added some ornaments to the chandelier over the dining table. 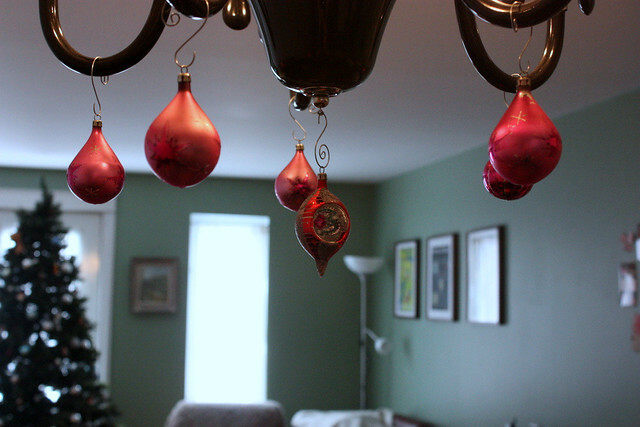 Another place to hang the extra delicate ornaments from. Taking this photo I'm standing in my kitchen and facing the living room. 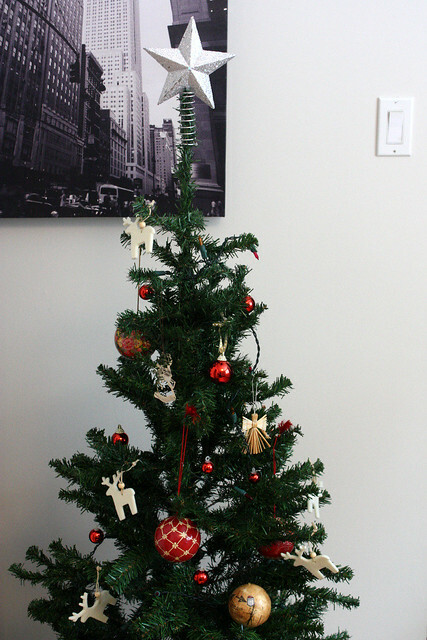 There aren't really any decorations in the office, but I do have another tree downstairs in the bedroom. The downstairs has the master bathroom and bedroom, some closet space and the laundry area. This is definitely more of a Scandinavian tree. More minimalistic with some definitely Scandinavian ornaments. 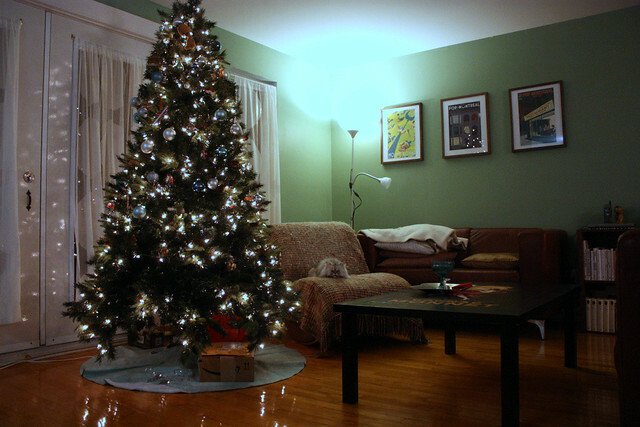 When it comes to Christmas trees, I'm definitely the "more is more" type rather than the minimalistic Scandinavian. 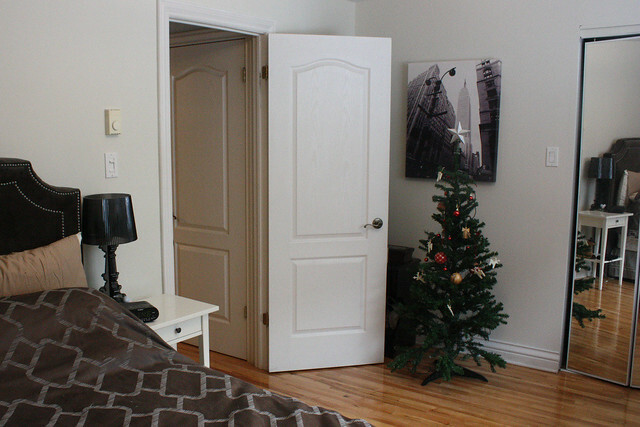 I took a few steps back from the tree to show you a bit more of the bedroom. The mirrored doors lead to the walk-in closet and the open door to a hallway with the washing machine, dryer and extra storage and ends next to the bathroom and the stairs leading back upstairs. This is the room I painted while Chris was in Vegas earlier this year. It used to be a dark eggplant colour. 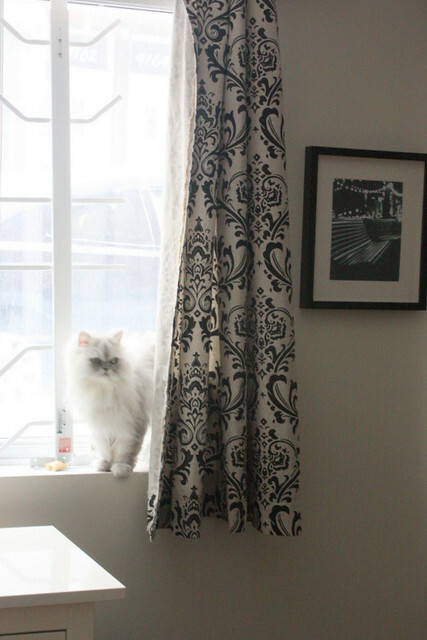 The bedroom is at street level, so the cats love sitting on the window sill. This is Gossamer trying to blend in with his surroundings. It's a bit hard to explain the setup, since you actually come into the condo from the top floor and still have a few rooms at the bottom which is not a basement. Well, it might not make sense as an explanation, but it works in reality. I would have to say that's the important part. I might show some more details and photos from the rest of the rooms later. I love coming up with fun little additions to our place, so there will definitely be neat things to share. More about that next year! I hope you all have a wonderful, fantastical, phenomenal and awesome-tastic holiday time! Since I've had candy on the brain since Friday, I gave in yesterday and decided to make some. Well, "make" is maybe an overstatement. I more like combined a few things and thought they came up pretty impressive. 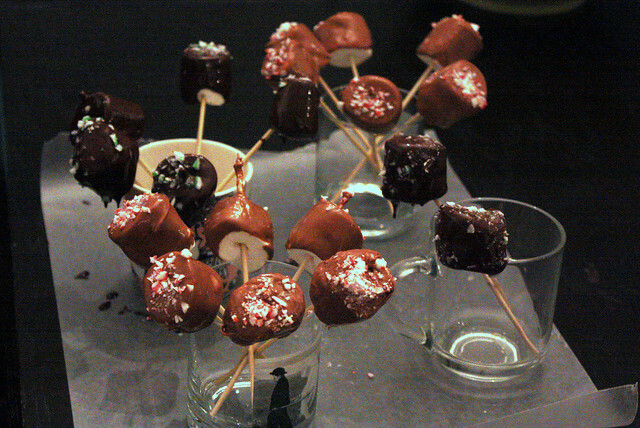 I decided to make marshmallow-chocolate pops. 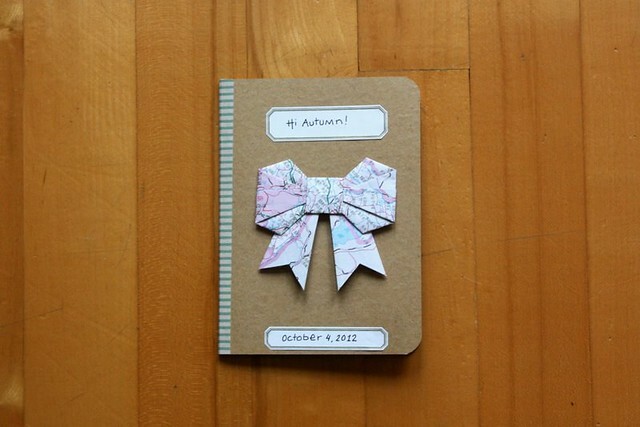 These are really easy and fast to make. The only part that takes a while is the cooling down phase afterwards. So, I recommend making them a few hours before you're serving them. I made mine in the afternoon and then went to dinner. They were perfect by the time I got back home. Chocolate, I used three different kind; 200g milk, 200g 70% cocoa dark, and 100g 70% cocoa dark with orange peel. The amounts are not too specific, but I found the chocolate in 100g bars, so I used 5 bars for the entire batch. a few peppermint candies, these go a long way crushed. I think I used 4 or 5. For equipment you'll need a small cooking pot and a small bowl that fits on top of the cooking pot as well as some glasses or mugs to stand the pops up in. Make sure your bowl can stand the heat (or tell it to leave the kitchen. heheheee. I think I'm hilarious). Melt your chocolate in the bowl, placed over the pot filled with water. Once the water starts to boil, it'll slowly heat the bowl and melt the chocolate. While that is melting, prepare your marshmallows by putting them on the sticks. I used regular wooden skewers that I cut in half (and by "I" I mean Chris). If they splinter easily, make sure you only insert the non-cut end into the marshmallow. Prepare your topping by crushing peppermint candy (I used the traditional round ones, but if you have some candy canes, that works great too) into small pieces. You could use a whole lot of different toppings. Maybe some more chocolate, finely grated. Different candies, like M&Ms or other colorful candy drops. I'm sure different kinds of nuts would work really well. The point is to just add another texture and some color on to the pops. Once the chocolate has melted, dip the marshmallow into the chocolate, twirl it around and gently knock the skewer onto the side of the bowl to get rid of the excess chocolate (if you don't, there's going to be a whole lot more cleaning to do afterwards. Add your topping while the chocolate is still warm and place the pop into a drinking glass or a mug. I placed 6 of the pops into one glass, that way there's enough room for them to cool down without touching the others. (They stick to each other if the chocolate is still soft) Once you're done, I'd recommend placing them in the fridge. The chocolate shell hardens better in the cold. 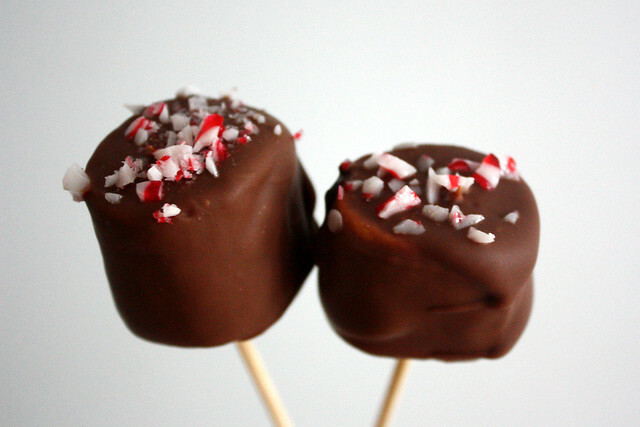 You can eat them as they are or use them as hot chocolate stirrers. 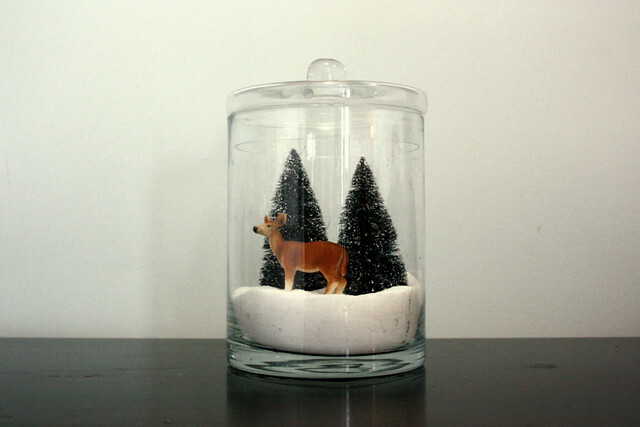 Another awesome little project I've been wanting to try out... A winter scene in a glass jar! I woke up this morning thinking about candy. This is not as rare of an occurrence as I would like to say it is, but today was special. I wanted to make candy. A number of years ago I made candy myself as part of my Christmas presents that year. I made a selection of chocolates. It's been a while since I've done that for Christmas, but I did make some for Chris earlier this year. Do you make candy yourself? What's your go-to recipe?